Bethesda Fountain rises above Bethesda Terrace and marks the heart of Central Park. A great place to cool off on a hot summer day, meet up with friends and enjoy the view of the sparkling lake, the grand staircase and the fountain surroundings are a magnet for street entertainment, workout groups, and weddings. Under the stairs, check out the gorgeous tile ceiling and listen to one of the many singers or musicians who take advantage of the wonderful acoustics. 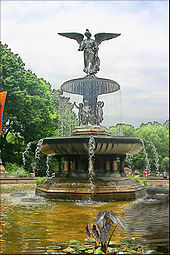 The fountain itself is adorned with the iconic “Angel of Waters” sculpture, and has served as a backdrop in various movies such as Hair and Godspell. The Alice in Wonderland sculpture is a must-visit for the whole family. As evidenced by the rubbed-off spots throughout, children love this artwork. The sculpture stands 11 feet tall and is frequently covered by kids trying to climb on Alice, the Mad Hatter and the Cheshire Cat. Not far from it is a bronze statue of Hans Christian Andersen, the Ugly Duckling at his feet, where storytelling happens on Saturday during the summer. Are you a Beatles fan? You’ll definitely want to explore Strawberry Fields, the Park’s teardrop-shaped memorial to John Lennon. Elm trees and flower gardens surround the area, and the often-photographed black and white “Imagine” mosaic lies at the center of the memorial. 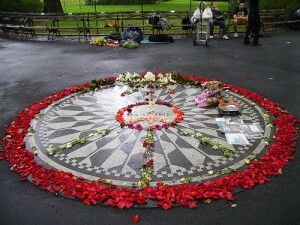 Strawberry Fields has been endorsed as a Garden of Peace and is a designated quiet zone in Central Park. If you venture just outside of Strawberry Fields, you’re sure to hear someone serenading guests with renditions of Lennon’s songs. Grab a summer reading book and enjoy the serenity of Central Park at Turtle Pond. This area of the park is another designated quiet zone. The only noises you might hear are from the little kids who often run around on the lawn or from of the very-quiet yoga and Pilates classes conducted on weekends in the area. Insider tip: walk towards the Delacorte Theater to pick up an iced coffee and waffle from the Waffels and Dinges cart usually parked there. 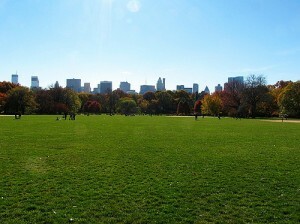 There’s no better place to chill than on Central Park’s Great Lawn. One of the most famous stretches of green space in the world, the Lawn spans 55 acres of lush pastures and provides a photo-worthy skyline view of NYC. Catch up on work or pack a picnic basket and a Frisbee and enjoy an afternoon with friends on the Lawn. Watch for news of concerts and events in future columns. Take a leisurely stroll through The Mall. This forty-foot wide pathway is lined with American elms and was created as a go-to place for people to gather and socialize, reminiscent of Les Tuileries in Paris and other pedestrian boulevards. The Mall’s main path is known as Literary Walk; take some time to stop and admire the statues of authors and artists such as Robert Burns and William Shakespeare. With a cathedral-like ambiance, the Mall is also a favorite site for street entertainers and has been featured in several movies, including Big Daddy and Maid in Manhattan. This entry was posted on Friday, May 25th, 2012 at 10:24 am	and is filed under Stuff to Do. You can follow any responses to this entry through the RSS 2.0 feed. You can leave a response, or trackback from your own site.